I recently had the fantastic (well, Zentabulous!) opportunity to spend some time on the East Coast. My dad, who is a comic book artist, is headed towards his 89th birthday! We’ll be having a family reunion/party for him when he hits 90, but this time was special for me to spend alone with him and his wife, Sue. If you are interested in learning about his comic book career, you can visit him at Sam Glanzman. He lives on 10 acres just outside Oneonta, NY (for you non-NY’ers, it’s 80 miles West of Albany). Oneonta is a wonderful, vibrant, college town. There’s lots to see and do (Cooperstown Baseball Hall of Fame is a great draw very near there). It was a great visit and we had perfect weather! While visiting, I decided to take advantage of being on the East Coast and also attended a week-long art camp. I was in heaven!! No phones to answer, no paperwork to push, no deadlines to meet (from the J.O.B.) It was just full days of learning the art form of Katazome. 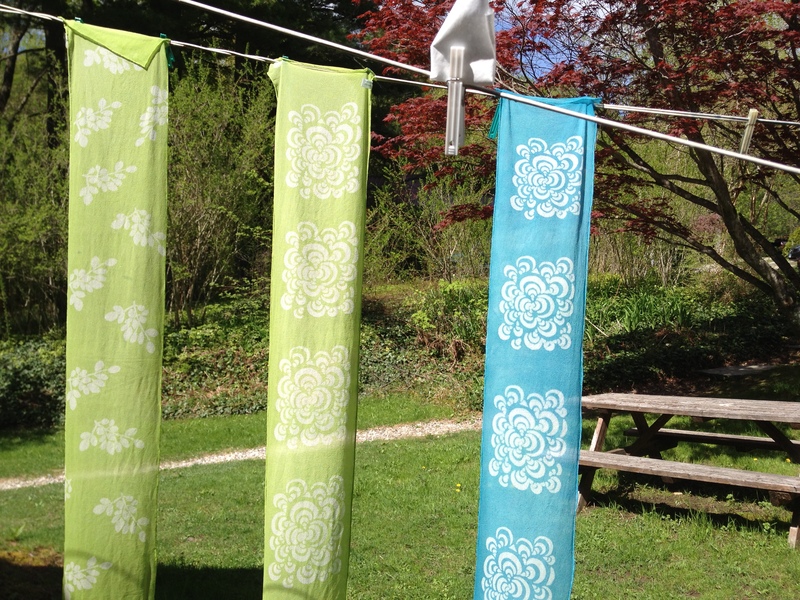 Katazome is the ancient art of a Japanese method of dyeing fabrics using a resist paste applied through a stencil. We learned from a teacher who tutored under John Marshall, who is well know in the art here in the States. It originated from Keisuke Serizawa, a Japanese textile artist. In 1956 he was designated as a National Treasure by the Japanese Government. Absolutely unbelievable work, so delicate, so innovative, so beautiful!! Here’s a link to a video that you can watch…Keisuke Serizawa. So, Serizawa tutored a woman (sorry, I don’t know her name), who tutored John Marshall, who tutored my teacher, Jenny Hermenze (of Vermont). So we were very honored to learn under her. We learned to design and cut our stencils out of this absolutely marvelous paper, which, by the way, they are apparently no longer producing (too bad because it was just incredible to work with – but apparently very expensive and painstaking to produce -sheet goes for about $50 each), screen the back of the stencil with silk netting, make/cook up the paste resist, apply the paste to the fabric with the stencil, dye the fabric, etc. This all took place at Snow Farm in Williamsburg, MA. A wonderful nonprofit organization that teaches any number of craft skills to those who are interested. Their classes run about $800 for the week, but it includes the classes, mostly all of the supplies, accommodations, and food – yes, let’s talk about the food! Wonderful meals 3 times a day…we certainly didn’t go hungry! You can visit Snow Farm to view the campus and see what they offer. Here’s a picture of one of my completed projects…and a contest! The first one** who emails me at EmeraldCityTangles@yahoo.com and tells me what the tangle name is on the blue scarf located on the far right will receive a beautiful Zentangle envelope (5.5″ x 7″) made from the green Lokta paper from the original Zentangle kits. These envelopes are no longer being produced so you can’t buy them. I have 10 in stock that I will be using for future give-aways so keep your eyes open on future posts.